Integrations | First Direct Corp.
Connect the apps you use, automate tasks, get more out of your GoldMine data. There are over 500+ Web Applications that can be integrated with GoldMine using Zapier. Zapier lets you create integrations between the business web applications you use every day. If you use a web application or web service and are interested in integrating and automating your apps and data with GoldMine please contact us to discuss your needs further. Automatically create/update a contact record in GoldMine when someone submits your Gravity Forms web forms. Automatically create/update a contact record in GoldMine when someone subscribes to/unsubscribes from your Mailchimp email list. Automatically add a GoldMine contact to an email list in Mailchimp from within GoldMine. Automatically create/update a contact record in GoldMine when someone subscribes to/unsubscribes from your Constant Contact email list. Automatically add a GoldMine contact to an email list in Constant Contact from within GoldMine. Automatically create/update a contact record in GoldMine when someone subscribes to/unsubscribes from your Active Campaign email list. Automatically add a GoldMine contact to an email list in Active Campaign from within GoldMine. Automatically create/update a contact record in GoldMine when someone subscribes/unsubscribes to/from your Campaign Monitor email list. Automatically add a GoldMine contact to an email list in Campaign Monitor from within GoldMine. Add a Goldmine Contact to QuickBooks Online with the click of a button. Automatically generate PDF and WORD docx files in Web Merge and merge in GoldMine information with the click of a button. Extract information from emails and create or update a contact record in GoldMine. Scan a business card (take a picture) with your smartphone and automatically create or update a contact record in GoldMine. Create a contact record in GoldMine from anonymous website visitors. 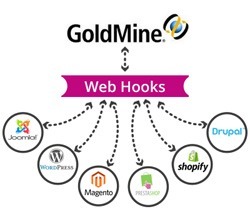 Please note: This is just a very short list of over 500+ web applications that we can integrate with GoldMine. Please contact First Direct Corp. if you are interested in integrating your Web Applications with GoldMine CRM.